Silver - the ultimate accolade. Hooray! 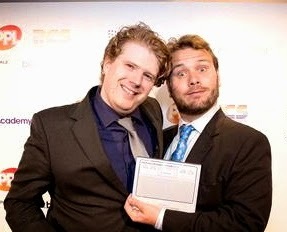 John Finnemore's Souvenir Programme won one of these at the Radio Academy awards! …And here's producer Ed and I looking pleased about it. On Sunday, Kevin and I had another look at the papers in, er, John and Kevin's Sunday Papers ; and tried to settle the equally vexed questions of who will win the next election; and why we've been invited to a club by some beagle puppies in frog hats. And on Friday, I was on The Now Show, talking mostly about scorpions, but also a bit about Vince Cable and the Royal Mail. You can listen to the whole show on iPlayer here for the next five or six days (and you should; it was a good one).